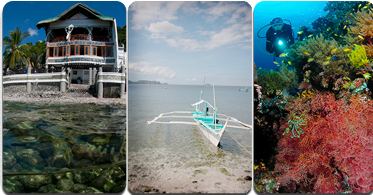 Just in time for the Beneath the Sea 2013 Dive Show, we are please to now offer this superb resort in Anilao, Batangas, Philippines. Crystal Blue Resort, located in front of the Authur's Rock Marine Sanctuary, invites you to experience warm Filipino hospitality to the stunning backdrop of the bay area of Anilao, Philippines. Crystal Blue is the ideal getaway for your next dive adventure. Nothing has been spared to bring you the finest in accommodations and dive services including the recently completed 18-station camera room. Video also available. Valet style diving has never been easier. The dive crew will carry your gear from the office to the dive deck. Once your gear is set our crew will handle the rest, Including loading and unloading the boats, tanks, cameras and anything else needed to make the dives complete. Anilao has been dubbed the best critter and macro site in the Philippines, and there are also some spectacular reef systems here too. That's right, sites like Kirby's rock and Beatrice are second to none for marine life and reef fish. Twin rocks is also supercharged with jacks, turtles, snappers, sweet lips and more. Crystal Blue is an underwater photographer paradise with pro Mike Bartick of SaltwaterPhoto.com on site to assist your needs. Mike also offers U/W photo seminars and can provide personal service. We are offering 7 night packages including accommodations, meals and diving for $1435 per person, add $100 for a week of nitrox. Once you dive this destination, you will want to extend your stay! 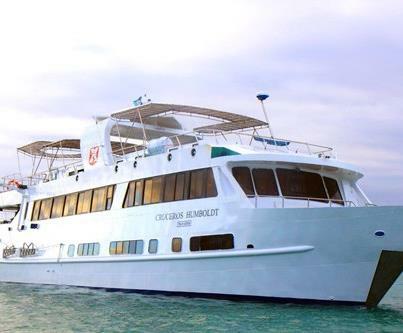 We are excited to be offering liveaboard diving adventures on the Rocio del Mar sailing out of San Jose del Cabo, Baja California. The Rocio is 110 feet of all steel construction, powered by twin turbo diesels, equipped with the latest marine electronics to get you to the best dive sites quickly and safely. Rocio del Mar has 10 staterooms, all with private bathrooms with hot shower stalls, western style toilets, lavatories and above height window. 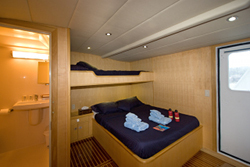 Each cabin is carpeted and air conditioned, with convenient gear and clothes storage drawers beneath the beds. 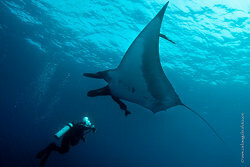 Come and dive with the friendliest giant mantas in the world. Whale sharks and humpback whales in season. Dolphins, schools of hammerhead sharks, six different types of sharks, along with a variety of other sea life. The 3 islands regularly visited are; San Benedicto, Socorro and Roca Partida. The Socorro Islands are 250 miles off Mexico’s Baja southern shore and are accessible from November through the end of May. This trip is 9 days long with 6 full days of diving!!! 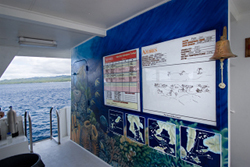 Liveaboard packages are $3195 with limited availability in 2013, booking into 2014. Book your trip today! Our latest offering in the Philippines is the Atlantis Azores liveaboard. 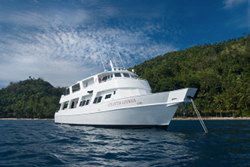 The Azores has set new standards in liveaboard diving in the Philippines and in Asia. Azores is the perfect place from which to explore some of the best diving in the world, offering four distinct itineraries showcasing parts of the Philippines, on schedules only possible by liveaboard. January through to mid March is Whaleshark season in Southern Leyte; enjoy unrivaled snorkeling action with these gentle giants and dive some unspoiled walls and slopes during the charter. Tubbataha Reef is on our "bucket list" of dive destinations. The most popular season runs from mid March through to early June – explore kilometers pristine drop offs and see just about anything. Dumaguete is base for the summer months of June through to September and the Visayas Safari is a unique opportunity to take in several beautiful islands in one week – something that would take several weeks, or several vacations to do any other way. October through to December the Azores is based out of Puerto Galera exploring the birth place of diving in the Philippines – Anilao, and heading down to Apo Reef on the West coast of Mindoro – a hidden gem only a few get to see. We have limited availability to Tubbataha Reef in early 2013 with 7 night packages at $3,495. Ask about our agent's discount on these charters. Contact us today! Start the New Year off with a trip of a lifetime....book a liveaboard to the Galapagos Islands and save $1000 per person with thsi 25th Anniversary Special from Explorer Ventures. 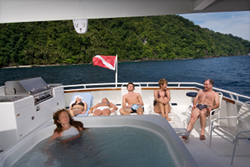 Available charter dates for this special are February 11-18, 2013 and February 25-March 4, 2013. Your underwater adventures in the Galapagos will encompass everything from sharks to nudibranchs, and more. The islands are best known for amazing shark diving around Wolf and Darwin Islands. These small and remote islands are best reached by liveaboard vessels and this is the trip to book. Your diving experience here will generally include Galapagos sharks, silky sharks and lots of schooling hammerheads being cleaned by king angelfish. Seeing marine turtles, schools of tuna, eagle rays, and sea lions is very common and seeing a whale shark is very possible from June through November. 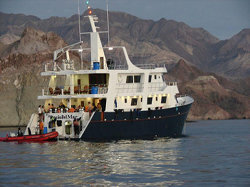 Book this liveaboard package with us and we will buy your nitrox...!! !